Online dating is a safe, fun and exciting way of meeting new people, as long as you keep your wits about you and keep your feet firmly on the ground. At Singles Over 70, we take online fraud very seriously and are constantly working to stamp it out. 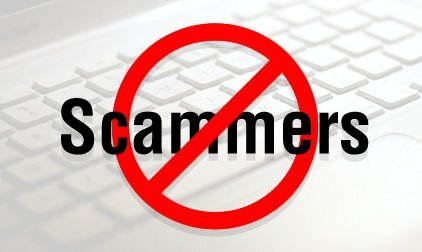 What Is A Dating Scammer? A Scammer is a person who, one way or another, may want to exploit you for their own gain. Scamming is a crime and when it is associated with online dating, we call it romance fraud. Does the person you are talking to, use language and grammar relative to where they say they are from? Is their spelling as good as you would expect it to be? Do they use English phrases incorrectly? Perhaps they start messages to you with "Hello Dear", or perhaps the content of the messages sound a little strange "I am George by name, I and 50 by age", "I hope to be reading from you soon". Is the person you are talking to, messaging you with expressions of undying love very early in your online relationship? Do not send any money to another dating member, no matter how persuasive they are. A scammer may ask you for money for any number of reasons, one of the commonest is to use the money to pay for a plane ticket, so that they may visit you. Another common tactic is for the scammer to request your bank details, with the promise of them depositing money they have inherited, into your bank account for safe keeping. Common scammer profiles may show them as working abroad, perhaps for a charity or in the armed forces. Sometimes the profile is blank, which may raise concerns about whether the member is able to write an English profile. Does the profile photo give the scammer away? If something feels wrong, it most probably is. If a dating member requests that you continue your discussion outside of the dating website that you first met too soon, perhaps via email or social media, do not reply to them. This is likely a tactic for the scammer to avoid detection by our dating website staff. How do I report a suspected scammer? Your report will be kept strictly confidential and the person that you have reported will not be aware of your report. We also suggest you activate the "Ignore" link following your report, so as not to be contacted by that member again. Don't worry, if you activate the ignore, the member you wish to ignore will not be able to see your profile anymore and will probably think you have left the service. We will then investigate your report and take whatever action is necessary.